Click Here To Read Latest Customer Reviews & Ratings on Amazon, Now! A gas powered pressure washer is always powerful than an electric pressure washer. In the market, you will find plenty of gas powered pressure washers and it is difficult to choose the best one that will be convenient for you. 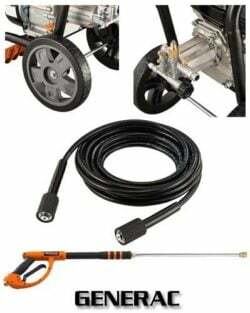 Considering all the features we have found out Generac 6596 2800PSI 2.5 GPM 196cc OHV Gas Pressure Washer is one of the best pressure washers that will fulfill your requirement. If you are thinking about some heavy duty cleaning in your house it can serve your purpose amiably. It provides the water pressure of 2800 PSI with 2.5 GPM of water flow for the tough cleaning. The device carries a 196cc OHV engine for smooth running and handling most cleanings in the house. The machine has 4 quick connect nozzles to deliver different kinds of water flow so that you can use it the way you want. It has a large detergent tank and the length of the hose gives you a good stretch. The unique foot rest gives you a good balance while starting the engine. The device has many useful features that can help you in your smooth cleaning. Generac 6596 2800PSI 2.5 GPM 196cc OHV Gas Pressure Washer has a horizontal shaft 196cc OHV engine with low oil shutdown feature. It has an Axial Cam Pump for easy connect to hose without kneeling down on the ground. The pump provides 2.5 GPM of water flow and the engine gives 2800 PSI of water pressure. There is a good combination between the water flow and the water pressure. The machine has ergonomic Generac spray gun with lance along with a very soft and convenient grip. There are 4 quick connect nozzle tips are provided with the device they are 0, 25, 40 –degree and a soap applicator nozzle. In the maneuverable card, the engine and pump are perfectly balanced and has a spray gun holster. It has a large detergent tank that can contain 3/4 gallon of pressure washer safe detergent. The detergent tank lets you take the cleaning solution comfortably that you need in your cleaning. The device has 25 foot of PVC hose which has a strong performance value. The hose connects to the rear of the spray gun and to the pump of the machine. The 10-inch wheel gives you the facility to carry the device wherever you want without any obstacles. It has user-friendly control to provide easy access to the engine control on/off. It has a unique foot rest stabilizer so that the machine stays quite during starting. Strong Engine: When it comes to power and strength you don’t really want to compromise. 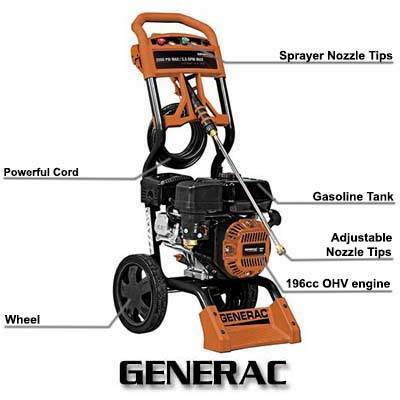 Generac 6596 2800PSI 2.5 GPM 196cc OHV Gas Pressure Washer gives you the power, strength, and durability at the same time. When you are going to do some heavy duty cleaning the machine provides you 2800 PSI of water pressure so that you don’t feel the pressure less. If you have pressure you need perfect water flow and the pump gives you 2.5 GPM water flow. The pressure and the water flow that you will get are very close to a commercial pressure washer. Different Nozzle Tips: Definitely you will not do the same kind of cleaning day after day there will be variations in your cleaning. When you have different nozzle tips you can easily connect them to your spray gun and get your desired water flow. The nozzle tips give you the water flow varied from a pencil point to 40-degree wide water flow. For applying soap there is a sop nozzle tip as well to give your car a shiny look. Detergent Tank: The detergent tank comfortably holds around 3/4 gallon of detergent to carry around. You don’t have to worry about holding a bucket of detergent and carry wherever you and to go. Warranty: The Company provides you with two years of limited warranty so that you don’t fall into any trouble. If there is any manufacturing defect you can easily call the company and get you device fixed or changed in these two years. Some users have informed that the Generac products are a little louder than the other pressures in the same class. It might be the case because of its powerful engine. Some of the users have raised the concern that plastic material has been used to decorate the hose. It might wear off on daily usage. You can easily use of taking another hose if you like. When you consider the price and the advantages you will get Generac 6596 2800PSI 2.5 GPM 196cc OHV Gas Pressure Washer comes at the top of your pressure washer list. The machine has power, strength and durability as you desire. This pressure washer will solve your problems starting from an easy cleaning to a heavy duty cleaning. You can easily depend on Generac Company as they have been making pressure washers for years and have become the very renowned manufacturer. All the features and the facilities that are provided by this device place it among the top pressure washers in the market. Click To Check Latest Price & Buy on Amazon.com!